Selecting and estimating flagstone patio materials is a very important part of your project. When buying flagstone you need to know the thickness you require, and how to estimate the amount. Understanding the composition and how to inspect pallets will also benefit you, and we will be covering these things in this section. As I said in the introduction, landscaping techniques can vary depending on the region you live in. The availability and cost of materials is also a factor to be considered. Stones can have different names depending on the quarry, region, or even the mountains they were mined from. This can be confusing when you read about different materials in a book and can't find someone that knows what product you are talking about. They probably have it, but might call it something different. I will try to be as generic as I can describing patio materials to avoid confusion. The amount of flagstone patio materials for your sub base will also vary depending on the climate you live in. For example: Sub-base requirements for southern or tropical climates, will be less than those for northern climates. Northern climates require deeper sub-bases to deal with mother nature. If you have more than one stone supplier in your area, then shop around as you would with any other major purchase. Spend some time browsing around their landscaping yards to see what products they have. Rainy days are best for "pre-shopping", because they will have more time for you if you lots of questions. Tell them what feature it is you are building, and ask for any product brochures, price lists, and any other info they may have for you. Ask what the reputable local landscapers are using for flagstone patio materials. Have a notebook with you before you venture out. From visiting the suppliers you will find that landscapers use different products under their flagstone patios. One may use a ¾ inch crushed washed rock with one or two inches of sand on top, and another may use only crushed limestone. Crushed limestone is the more expensive of the two, but both may be just as effective. Your decision will usually be based on your budget like any other purchase. For beginners, the flatter the stone, the easier it is to stabilize into your base. Look for the best stone pallets you can find. They should actually allow you to pick your own stone pallets for large projects, or individual stones for smaller ones. Stones with the flattest surfaces on both sides will make things a lot easier for you when laying them. This is what you are paying good money for, so make sure you have good quality stones. I have found that the well stacked and neat pallets have less junk hiding in the middle or bottom. 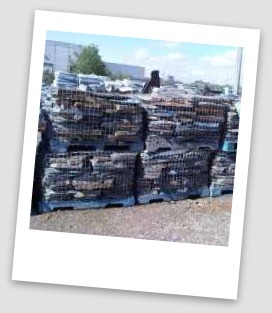 Inspect as many rocks as you can by walking around the pallet, and look for consistency in the thickness. Having consistent thickness of stone will limit the amount of base adjustments to the bedding sand when you are laying them. This will save you time. Make sure you choose stone that you can handle and place yourself or with a helper without hurting your back. Large slabs can make the work go faster, but you will need extra hands to place and stabilize them. Inquire about the landscaping yards return policy if they have one. You will have about 5 to 10 % in wastage. This is normal. The more experienced you are, the less you have. If you find a pallet has a lot of junk on it, ask them if you can return or exchange it. (This doesn't mean pieces that you have broken, trimmed or split.) Lesser quality surface stones can also be used for stepping stones, or other projects in your yard. Some stones have a different geological composition from the way they were formed. Metamorphic stones are altered by extreme heat and pressure that effects the way they react when being struck with hand tools. They may not all be that easy to work with when trimming, splitting, or shaping. Make sure that you pick a stone that isn't brittle. Otherwise you won't be able to knock off edges and corners without damaging or shattering the stones. Being able to work with the stones enables you to fit them together with smaller gaps. If you are building a patio with larger gaps between the stones, this will not be as much of an issue to you. You should also be aware that iron or other minerals in the stone can actually stain concrete, or even affect nearby plant life. Try to find a product that is consistently in stock, or at least a regular product line. This is in case you didn't order enough, or want to add to your feature later with the same material. Try not to use stones that are less than 2 inches in thickness for a dry-laid patio. (A minimum of 1 ¾ inch thickness is ok.) If the patio stones are too thin, they can crack quite easily if something is dropped on them. I am aware that some landscapers will use thinner stones for dry-laid projects, but I don't recommend it. This is not an exact science, as stones can vary in thickness and density. (This is another reason why I had you inquire about a return policy.) You will need to measure the length times the width for the square footage of the surface area. Again, this can vary depending on the density of the stone. Let's look at an example using 90 sq ft per ton. eg. A 400 sq. ft. patio divided by 90 sq. ft. = approx 4.5 tons of stone. The landscape yard should be able to verify this from your measurements, as they are more familiar with the stones they are selling. The local landscapers also give them feedback on how much coverage they are getting from the products. We also have an Advanced Flagstone Tips page that talks about how to buy flagstone and important aspects to consider to make your life easier. North America and other parts of the world are divided into climate or hardiness zones. Sub-base requirements vary depending on the zone you live in. Northern climates could require six to eight inches of packed sub-base. Southern climates may only need two or four inches. Your local stone yards and gravel suppliers will be able to tell you what you require for your region. You can also check out our sub-base depth reference material. When it comes to the sub-base more will never hurt you, but less can. Gravel, sand and crushed rocks, have a slightly different formula and are usually sold by the yard. To estimate the amount you require, you will need to know the cubic feet of your excavation area. Length times width times depth in feet. This gives you the cubic feet of area. Divide this number by the magical conversion number of 27, and this gives you the cubic yards required. Remember that you will need a 1 or 2 inch layer of crushed stone or sand on top of the sub base as a bedding material for the flagstone. Ordering sand or crushed stone for your bedding material uses the same formula as the gravel sub base. 200 divided by 27, gives you 7.5 yards required for the sub-base. Landscaping yards don't usually sell anything less than ½ yards unless they have weight scales. Round up on your estimates so you don't end up short on materials. Check out our advanced tips on accurately estimating sub-base materials. Why do so many people under estimate the flagstone patio materials required? There are two main reasons why people end up short on materials. Number one is not accounting for wastage. It is normal to have wastage from breakage, splitting, and trimming of stones. This is usually around 5% to 10%. The better your skill level is working with the stones, the lower amount of wastage you will have. The second reason is that a patio that is 12 ft. by 12 ft. will have a base area of about 13 by 13. To support the edge pieces of stones and to install an edge restraint device, you will need a base that extends at least 4 to 6 inches past your patio area. Now that you have been made aware of this, order accordingly. You will need edging around the perimeter pieces where they connect to the transition zones or grass as support. They wikeep the stones in place, and also keep grass from migrating into the stone patio area. There are different kinds of edging available, so talk to your landscape supply yard, they will recommend the proper edging for you. hard plastic or metal edging that is held in with 8 to 10 inch spikes are adequate. The edging I use is hard plastic that is sold in 7.5 ft lengths. Measure the outside area of your patio before you go to the landscaping yard. You won't need any edging up against a house or other solid foundation. You may want to use a weed fabric under certain projects, although most patio projects don't require this. It may or may not be necessary depending on your situation. Talk to your local supply yard with the specifics of your site so they can give you some guidance with issues like this. For jointing between the stones you can use a few different materials. Polymeric sand stabilizes the stones, seals the joints from water and weeds, resists washouts, and is quite popular. You can use a fine crushed material from the stone yard to brush into the cracks. It will not have the same sealing qualities of polymeric sand keeping water or weeds from getting into the cracks. It can also be washed out in a heavy rain. Jointing sand is not recommended if the joint spacing between stones of your patio is greater than 2 inches. If this is the case, you may want to consider mixing your own polymer with a larger aggregate. We have a 14 page article dedicated to estimating landscaping materials. You may find this information useful in preparing yourself, before your go to any of your landscaping yards to purchase materials. Now you have all the tools and materials that you will need to do the job. It's time to move on the the next stage of Preparing the Site.